When a plant is fed organic fertilizer it is strengthened, thus preventing plague from developing in the plant, minimizing adverse effects in a natural manner, and protecting the ecosystem from being negatively affected. Some agricultural workers burn weeds using banned chemicals. It is an inexpensive process, but harmful to the plant, to the ecosystem and to human consumption. Selection of plant offshoots "hijuelos"
The offshoot must come from an organic “mother”. When it is ready to be planted, it is removed from the mother plant to be nourished before planting it. This is to generate sufficient resistance in the offshoot to prevent noxious organisms from harming it, using microorganisms and nutrients permitted by the International Norms for Organic Certification. To bring benefits to the plant means to add organic fertilizer and nutrients, for a better development and soil enrichment. It is a process that involves time, dedication, knowledge, perseverance and responsibility on behalf of the producer. 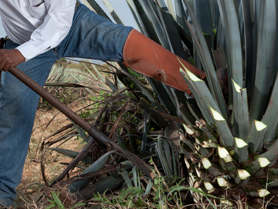 1° Trimming.- Using a cutter or trimmer, grooves are cleaned, and weed is removed between each agave row. 2° Scything "Casanguear".- Each year, during the dry season, areas around the agave are cleaned with a tool called “casanga” and also manually, this removes the tare that grows around the plant, that obstructs the passage of sunlight and steals nutrients from the agave; the weed is reincorporated to the same land to enrich the soil in preparation for an eight year period; which is the time it takes an agave to reach maturity and to be harvested. 3° Plowing.- Is an excellent agricultural practice in the care of agaves, which allows us to maintain the grooves without weed, and to enrich the land by reincorporating the weed. But more importantly, it helps capture a great amount of water in the rainy season, allowing the crop to maintain itself all year round with water from the season; this also allows better ventilation of the roots. 4° Nutrition.- In each phase of development the agave must be fed according to its age. Phase 1: Initiation, which goes from 1 to 3 years; Phase 2: Development, 3 to 5 years; and, Phase 3: Fructification, from 5 to 8 years. The organic fertilizer used to nourish the plant, is compost of vegetable and animal origin, with high content of nutrients and microorganisms that help the biological control of pests, diseases, and enrich the soil. Organic production does not use contaminant chemicals, such as herbicides and fungicides because they have an adverse effect on the plant, on the ecosystem, and on humans, if consumed when processing the agave. 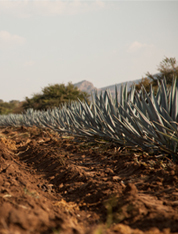 In addition to the advantages brought about in the quality of the agave in terms of development, maturing time, and sugar concentration, there is increased efficiency in land and energy use. This benefits the local population and consumers all over the world. Finally, there is increased employment opportunities for the regional population because organic production of agave is labor intensive, requiring a great deal of care. As a result of the careful process, the plant achieves full potential and optimum development. It is clear, not only that the plant is healthier, but that it maximizes its size, enhances its sugars and shortens the time to reach maturity.